Switch up breakfast traditions—swap cinnamon out for caraway seeds. Preheat oven to 350°F. Grease the bottom of a loaf pan and set aside. 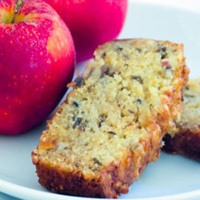 In a large mixing bowl, combine the grated apples, egg, sugar, oil, and caraway seeds. Sift together the flour, baking soda, baking powder, and kosher salt in a separate bowl. Add the dry ingredients to the wet ingredients and mix until just combined. Batter will be lumpy. Pour into the greased loaf pan. Bake for 50 to 60 minutes, or until bread is golden brown and passes the toothpick test.